Some of us have fussy feet, and get blisters easily. I am one of those people. For me, finding comfortable shoes has been rather difficult, and many times I have ended up with new shoes in my closet for good -- until I figured out the designs that work best and leave no room for blisters or chafing at the back of the foot. They come from some of the top shoe brands out there. They're not always cheap, but sometimes you can find great deals online. Remember, however, that even if you pay more for them, these are shoes that you will wear for a long time, as they're made not only for comfort: they're also made to last. Read on for shoes to wear at the office, at the gym, in the city, on hikes, on your runs, and while traveling abroad to cities, the countryside, or the beach. 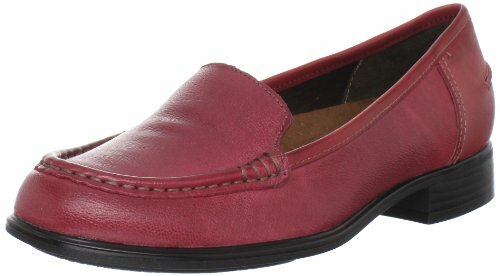 Some of the most comfortable shoes I’ve worn look like these slip-ons from Clarks. I also like the design. It’s casual but you can also wear them to the office if you don’t dress to the nines for work. And they’re so comfortable that you can easily wear them when you travel: your feet won’t hurt at the end of the long day of walking around a city. I know what I'm talking about. I bought a pair in Barcelona when I needed a pair of shoes with a cushioned footbed to relieve the pain in my soles. The style I'm showing above has been in fashion for a few years. Or at least I started buying shoes like that a few years ago. I hope they keep making them. They look good with jeans and other types of pants, and they also looks good with skirts. The Clarks slip-on shoes to the right come in several different colors. Note that Clarks makes all kinds of footwear, from lace-up sneaker-style shoes, to desert boots (also called chukka boots in the US), classic loafers, and elegant ballet flats to match a dressy outfit at work. Indeed, they have so many lines of design that they are like many shoe makers in one! I find it fabulous. And while their comfort is tops, their prices are not top-of-the-line. Another brand I like is Ecco. Ecco has bolder designs than Clarks, including some dressier comfy shoes. I like their boots in particular. They’re comfortable and they’re quite versatile: they look great with jeans, they’re hot-looking for a night out, and they’re also stylish enough to wear to work (okay, that harness may not appear to be 100% elegant at times, but wear them with pants at work and they will look absolutely fabulous). The harness ankle ones I’m showing come in black and reddish brown (mink). Yes, they’re not very cheap – but I think it’s worth it. They have a great build, are very comfortable, and the leather looks great. 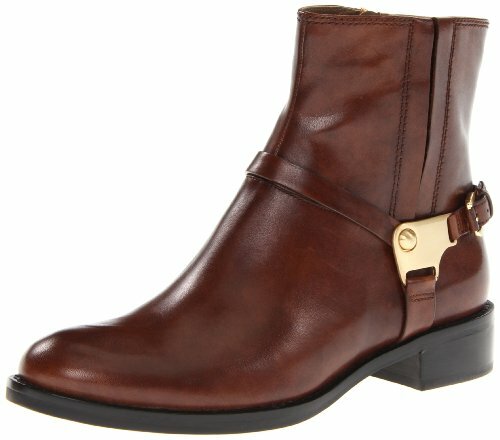 If you want a handsome low-heel ankle boot, then this boot from Ecco is one of your best bets. Rieker Shoes started in Germany in 1874. If you travel to Germany today, you'll see Riekers everywhere. I have owned a few pairs of Rieker shoes and sandals and they have all been comfortable. When I can't find Clarks, I look for Riekers. They are comfy and stylish. 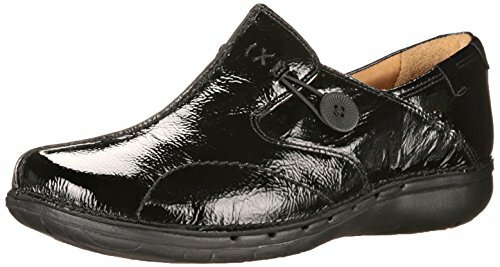 Many Rieker shoes for women are available online on Amazon. I love their new designs. You'll notice that each of the brands presented here in this article has its own distinct appeal. And all these shoes combine comfort with a trendy look and durability. Josef Seibel shoes are also very comfortable and they have a great market presence here in Romania, so I’ve tried quite a few. 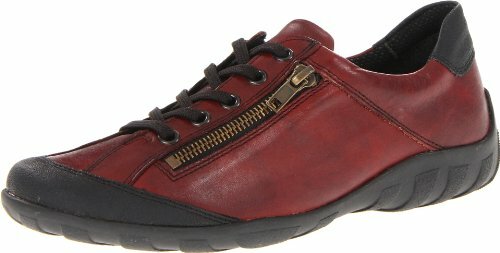 Amazon has a great selection of Josef Seibel shoes. Josef Seibel has lots of sandals I like. The design I’m showing is similar to many I’ve seen over the past few years, but then sandals like these never go out of fashion. They come in black, red, and crème, and in many sizes. They are more expensive if you get them in the US, but Seibel shoes last a long time. Sometimes those straps give me blisters, and sometimes they don't. I can never tell. Josef Seibel is a relatively new brand on the Romanian market. I don't think I knew about Joseph Seibel ten years ago, even though they make shoes since 1886. They have carved quite a market share for themselves in Romania over the past few years. Their shoes tend to be cheaper than Rieker's. When it comes to running shoes, Nike is my favorite brand. I use them at the gym, on hikes, and during my travels to foreign cities. Sometimes, if you want to see a whole lot in a day, you simply need to have sports shoes on or your feet soles will really hurt at the end of the day. Okay, that does make you look like a tourist, but you gotta do what you can to get through the day. 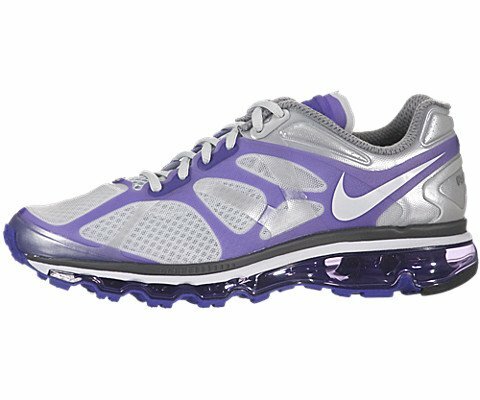 Nike has many designs I like and all the shoes I’ve tried from them were super comfortable and rather light. 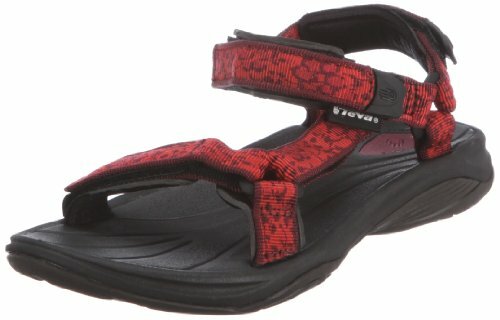 Speaking of comfy shoes to wear when traveling, certain Tevas are great walking shoes. The ones I’m showing are comfortable (other designs may give you blisters), durable, and you can wear them at the beach too, on the sand and in the water. If you travel in the summer, these are must-haves, as they are great for all terrain – well, except for serious trekking, where you climb steep slopes, the ground is muddy, etc. Pam (Dustytoes) mentioned in the comments section that her favorite brand is Simple, now out of business. Simple Shoes was a sneaker company started in Santa Barbara in 1991. They were not just any sneaker maker. They used recycled materials in their footwear (car tires, recycled plastic bottles, etc.) and even started a line of biodegradable sneakers in the spring of 2010. Unfortunately, Deckers, the parent company of Simple Shoes, abandoned this brand. According to former Simple and Teva president Peter Worley, the eco-friendly trait of Simple Shoes got to be too much a part of the brand's image and "too serious" a message. Deckers now promotes Sanuk shoes instead of Simple Shoes. Instead of sneakers, they tend to be washable canvas slip-ons and thong sandals. Like Simple Shoes, Sanuk is also an eco-friendly brand. I have always wanted to buy myself Camper shoes, but never went the length of spending that money. Camper shoes are the most expensive of the whole bunch of shoes made for comfort that I'm showing here, so it's natural that one would stop in one's tracks and think hard before making a decision. Nevertheless, after many years of dithering, I have just made the decision to buy a pair this spring. It was helped, in part, by some of the comments you can see below, at the end of this article. Now I don't know what kind of Camper shoe to get first. They are famous for their colorful flats: fashion sneakers, ballet flats, you name it. They also have Mary Jane pumps and comfy sandals. I've selected below some Camper footwear which appeals to me. Hope it will inspire you, too, to get a pair of Camper shoes this spring. There are several other shoe brands made for comfort out there, with yet other lines of design, such as Hush Puppies or Birkenstocks. I thought I should list them here to have a list of the major players on the European and North American market for comfortable shoes. 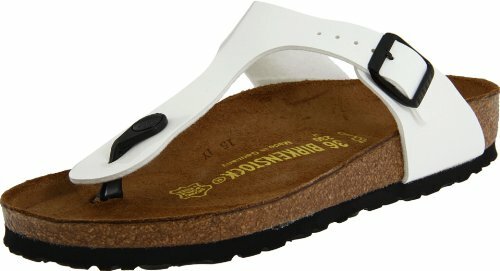 I'm showing below my favorite kind of sandals from Birkenstocks. They come in several colors. 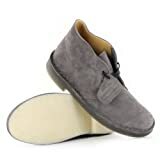 I'm also showing a moccassin shoe from Hush Puppies since their moccasin slip-ons have the classic look -- one which Clarks also had at one point, but not anymore, from what I've seen. These moccasins from Hush Puppies, unlike other shoes of similar design can may find from other shoemakers, have the advantage of being extra comfortable. If you liked this page, Spread the Word/Image! What are YOUR Favorite Brands for Comfy Shoes? Mira, Very nice! My favorites are Hush Puppies and Okabashi. Have you ever tried the latter? Yes, you're right. Thank you! I saw a couple of flat boots on QVC yesterday. You can check their website. Yes, I love Clarks. Unfortunately boot design this winter is completely wacko. I can't find anything I like. I was hoping Clarks might have something, but they just go with what's fashionable: those wedge platforms, and boots with that band of elastic, which isn't that great if you're wading through snow. Then there are those boots with a rather high heel -- again something I don't want. I just wish it wasn't all about fashion. :) I wish they kept some classic designs year after year, the way they do in shoes. Hi Emma, walking barefoot can be wonderful! Do you also wear Clarks shoes? 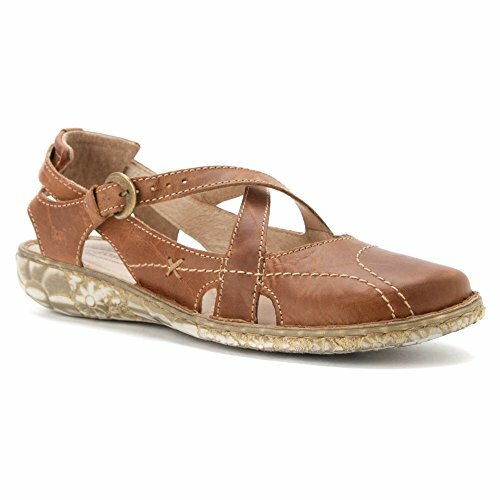 Coming back to my own page, I'm thinking those Clarks ballet flats would be quite nice for long walks. Thank you, ologsinquito. It's hard to find comfy footwear these days. In Europe Rieker shoes are probably the best value for the money, I think, but every one of these brands offers something that the others don't. In the US, looking at the prices I found, I'd say Clarks is the brand to try first, especially as they're so versatile. That said, Ecco has some nice designs, too. As I mentioned in another comment, I got a pair of Ecco sandals this summer and it was a good choice. This is a great resource for people with feet or back problems. Those Ecco boots are so stylish.